Devour! The Food Film Fest promises six jam-packed days of culinary films, food and drink for the eighth annual festival taking place October 23 – 28 in Wolfville, Kentville, and Kings County, Nova Scotia. The robust programming lineup presents culinary delights crafted by internationally-renowned chefs from around the world, terroir-driven experiential tours, industry workshops in film and food, and multiple tastings, including in-theatre presentations. High profile chefs, including Chicago’s Jean Joho (Everest), acclaimed author and canning expert Paul Virant (Vie), BBQ legend Meathead Goldwyn, and Eduardo Garcia, star of the eponymous documentary Charged: The Eduardo Garcia Story, are among the industry leaders, professionals, and rising culinary stars participating to serve up great food. Special guests in attendance also include former White House Chef for the Obamas and food activist Sam Kass, TV personality Bob Blumer, James Beard Award-nominee Questlove of The Roots, and more than fifty local chefs and food producers. The Festival’s ongoing partnerships with renowned culinary schools help provide real-world experience, skills development, and valuable industry connections for Canada’s next generation of culinary leaders. Faculty and students of New York City’s The International Culinary Center will participate in Devour! for the first time, along with the returning festival partners The Nova Scotia Community College, the Pacific Institute of Culinary Arts (Vancouver), and George Brown College (Toronto). Devour! expands into Kentville, NS for the first time with the new Devour! Kentville: Sip & Savour pre-festival celebration offering local delectable bites and drinks from Kentville-area businesses. Tickets are $20 and include food and beverage. A portion of the proceeds will support Nourish Nova Scotia. Sponsored by the Town of Kentville, the Kentville Business Community, and the Valley Regional Enterprise Network. The Festival will officially open with the annual Taste of Nova Scotia Opening Gala Reception, with special guests former White House Chef for the Obamas and food activist Chef Sam Kass, and Devour! alum, celebrity chef, and TV host, Bob Blumer. Twelve of Nova Scotia’s finest chefs join together to create a sensory exploration of local cuisine. Tickets are $50 and include food and beverage. The gala screening of André – The Voice of Wine, directed by Mark Tchelistcheff, will be followed by a gourmet five-course dinner complete with wine pairings inspired by the film. Tchelistcheff will attend the celebratory meal prepared by respected chefs Michael Blackie (NEXT, Ottawa), Peter Dewar (Nova Scotia Community College, Kentville), Ryan Keough (Spuntino, New York), Christopher Pyne (Founders House, Annapolis Royal, NS), Brandon Olsen (La Banane, Toronto), and Louis Bouchard Trudeau (Bouchon, Quebec City). Tickets are $150 and include food and beverage, as well as access to the after party: The Deep Dish – A Party for Chicago. The wildly popular Devour! Street Food Party, sponsored by the Wolfville Business Development Corporation (WBDC) and Wilson’s Home Heating, is free to attend and hosts a wide range of food and beverage offerings from multiple regional vendors at family and student friendly prices. The party takes place in Robie Tufts Park, Wolfville, rain or shine. Following the gala screening of the inspiring documentary Charged: The Eduardo Garcia Story, an all-star team of chefs from across North America will present a five-course menu with wine pairings inspired by the film. The evening’s chefs include the subject of the film, Eduardo Garcia (Montana Mex, Montana), whose near-death accident after being shocked by 2400 volts of electricity came to inspire others through his story of survival and recovery. Joining Garcia will be John Higgins and Glenn White (George Brown College, Toronto), Blair Lebsack (RGE RD, Edmonton), Annaleisa Scigliano (NSCC), Charlotte Langley (Scout Canning, Toronto), and Martin Ruíz Salvador (Fleur de Sel, NS). Tickets are $150 and include food and beverage, as well as access to the Devour! Spotlight Gala Party. The annual favourite Devour! Chowder Smackdown will return as 10 local restaurateurs cook up their best chowder to compete for attendee votes. Tickets are $20 and include all the chowder you can eat. For the first time ever, and by popular demand, Devour! will host the inaugural classic Nova Scotia lobster supper under winery Lightfoot & Wolfville’s marquee tent. At the same time, 150 guests will be attending the Devour! Road Show: Celebrity Chef Film Dinner, a five-course dinner with wine pairings, in the stunning Lightfoot & Wolfville Barrel Cellar. Chefs Mark Bauer (ICC, New York), Darren Clay (PICA, Vancouver), Geoff Hopgood (Lightfoot & Wolfville, Wolfville), Jean Joho (Everest, Chicago), and Paul Virant (Vie, Chicago) will each cook up a dish inspired by one of five short films that will be screened prior to each course. The night will culminate in the Devour! Cocktail Pop-Up Party complete with signature cocktails by Devour! mixologists, and live music by the Mark Riley Project. Tickets are $200 and include food and beverages. Sponsored by the Royal Bank of Canada. Devour! presents the Golden Tine Awards for films in five categories: Best Short Documentary, Best Short Drama, Best Feature Documentary, Best Feature Drama and Best Animation, chosen by an esteemed jury to celebrate outstanding films at the annual awards brunch. The brunch will feature food prepared by five chefs from some of the province’s most popular and tasty brunch spots. Tickets are $25 and include food and beverage. Sponsored by the Egg Farmers of Nova Scotia and Compass Distillers. The 2018 programming lineup features more than 20 food and drink focused workshops. In this hands-on workshop, aspiring junior culinary masters ages 12-17 have the opportunity to learn the secrets behind great dishes with the guidance of instructors and students from respected culinary institutions from across Canada. The master class requires advance registration and is only $5. All food produced will be distributed to local senior citizens homes. Sponsored by the Rotary Club Wolfville – Mud Creek. Author and Barbeque guru Meathead Goldwyn uses science to help improve technique and elevate the barbeque game with the support of Chef Bill Pratt (Iron Chef competitor; Executive Chef of Chef Inspired Group of Restaurants) in a luncheon workshop that is guaranteed to be fulfilling! Tickets are $65 and include lunch and drink pairings. Sponsored by Big Erics and Mer Et Soleil. In search of the deepest roots of Nova Scotia’s Gaspereau Valley, Benjamin Bridge invites guests to its luscious vineyards to learn about the pre-European history of the area and experience Mi’kmaq food traditions. In partnership with Glooscap First Nation, food and wine pairing stations will feature the culinary collaborations of Mi’kmaq community members and Devour! chefs. Tickets are $85 and include food and drink pairings. Sponsored by Benjamin Bridge Winery. This Scotch tasting and lunch features a sampling of venerated Scotches, selected by Whisky expert Johanne McInnis (The Whisky Lassie), which demonstrate the regional differences in Scotch. Chef Mark Gray (Executive Chef of The Watch that Ends the Night) will present a menu of dishes that complement the flavours of each Scotch. Tickets are $65. Sponsored by Mer Et Soleil and Grand Pré Winery. New this year, master forager Frédéric Dardenne (FD Wild Foods) will lead participants on a two-hour walk through the local forest in search of fall season wild foods. Dardenne supplies some of the best chefs and restaurants worldwide with the bounty of foraged treasures from Nova Scotia. Tickets are $30 and include transportation from Wolfville. 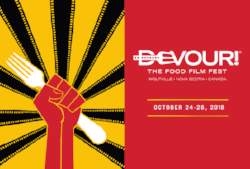 For more information and additional festival programming, please visit devourfest.com.